Quick note... for those not already listening, my buddy Patrick O’Shaughnessy has one of the (if not the) best investing podcasts out there with his podcast Invest Like the Best. Each week he sits down with some of the best capital allocators, investment thinkers, etc... in the world and really allows his guests to share deep insights. I highly recommend it to anyone reading this who isn't already doing so. Patrick's guest this week was David Salem, the founding president and CIO for The Investment Fund for Foundations. The discussion was great as always, but I would like to focus on one small aspect related to where in the world he currently finds value. He specifically makes the case for Asia ex-Japan ex-China for a number of reasons I agree with (value and alignment of management with shareholders), but he seemingly gets one aspect (which he views as a negative) wrong based on his view of what historical analysis reveals. The point of this post is to outline this flaw with supporting data because it's a common theory and one that can seemingly be dismissed when the data itself is viewed. It also happens to makes his case for an allocation to Asia ex-Japan ex-China even stronger. We also have some money allocated under present conditions to I’ll call it Asia ex-Japan ex-China. Here’s where a careful study of long-term capital market history will tell you, and my favorite source of this is of course is Elroy Dimson, Paul Marsh, and Mike Staunton’s book Triumph of the Optimist and all the sequels to it, will tell you that high growth economies that are flattered by relatively high growth rates of the GDP level and by favorable demography tend to generate surprisingly, perhaps to many people, sub-par returns. So. You’re a value guy, I’m a value guy. We get that. So, why would we be chasing return for long-term capital in Asia ex-Japan and even ex-China, and it’s because I’d say almost notwithstanding the favorable demographics and the relatively favorable debt profile the prices, the current prices at which interest can be acquired in well managed businesses where the managements have a sufficient, not perfect, but sufficient alignment of interest with outside shareholders, they tend to be family controlled and family dominated. To summarize… he has found value in Asia ex-Japan ex-China DESPITE its favorable growth and demographics. To be blunt… this appears to be a common mistake and one that is likely flat out wrong. Here are other heavy hitters quoting Dimon, Marsh, and Staunton making the same case. 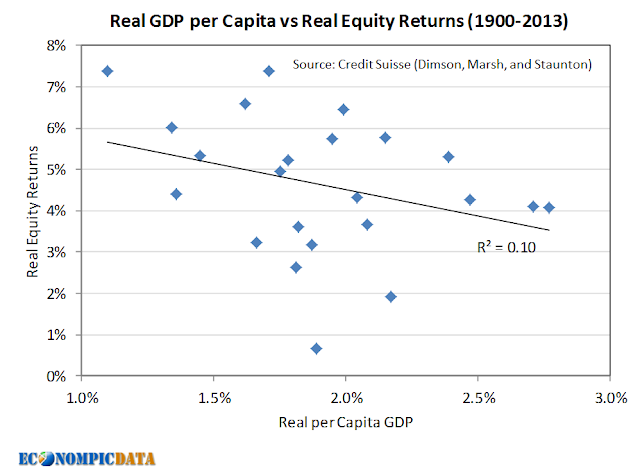 Analysis by Elroy Dimson, Paul Marsh and Mike Staunton of the London Business School of 19 major countries between 1900 and 2011 shows that the correlation between the compound real rate of return on equities and the compound growth rate of real per capita GDP is minus 0.39. Investors would have been best off investing in the most sluggish economies. Similar analysis of 15 major emerging markets between 1988 and 2011 produces a remarkably similar negative correlation of minus 0.41. To be fair, some other combinations produce correlations nearer to zero. But, to the chagrin of emerging market bulls, whichever way the data are interrogated, a meaningful positive correlation between GDP growth and equity returns remains elusive. The annual report on markets by Elroy Dimson, Paul Marsh, and Mike Staunton of the London Business School (produced in association with Credit Suisse) is always good value and this year's effort is no exception. The main theme is related to emerging markets and will be the focus of this week's column. But one oddity emerged in the course of the report that is quite difficult to explain and is worth exploring in more detail. An oft-quoted argument for investing in emerging markets is their superior economic growth. But the professors have pointed out in the past that economic growth and equity returns are not correlated at all. This Economist article was in reference to the 2014 Credit Suisse Yearbook (which contains all the pertinent data) and is fortunately still available online. Let's take a look. The data for the following charts were all pulled from Table 1 in the pdf (reproduced below for any of you nerds that wants easy access). The first chart is a reproduction of the chart from the yearbook that is commonly shared to make the case that real GDP and real equity returns have a limited or negative relationship. Even Dimson, Marsh and Staunton state investors do not capture economic growth (bold mine) based on the downward slope and r-square of 0.10. 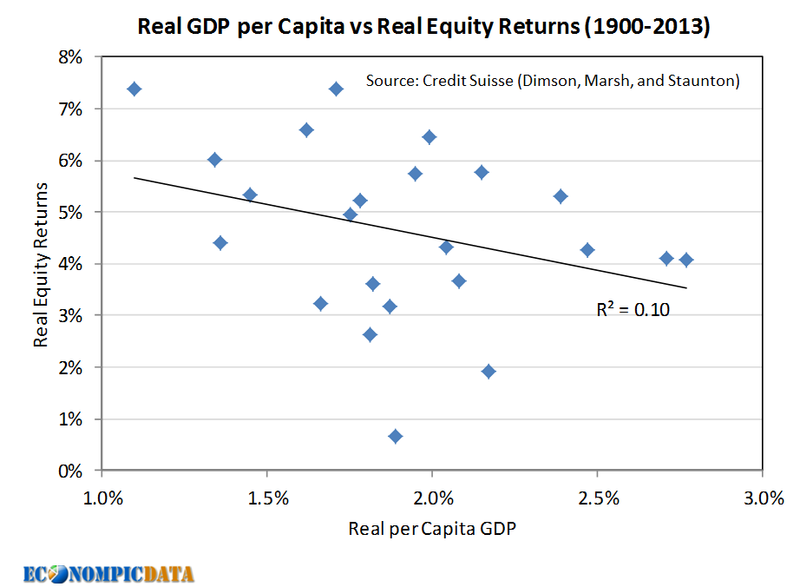 The horizontal axis measures the growth in per capita real GDP, while the vertical axis displays the annualized real return, including reinvested dividends, from each equity market over the entire period since 1900. In the cross section of countries, it appears that equity investors do not capture benefits as a result of economic advancement, as measured by per capita real GDP. Let's think about the apples to oranges issue here. 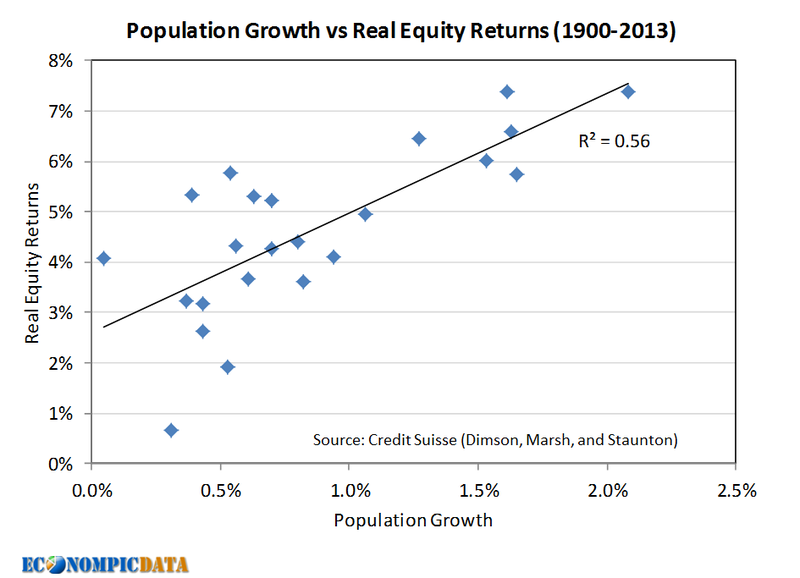 Per capita GDP is the level of GDP per person, whereas equity growth is the equity returns in aggregate. This would be like wondering why you can't lose weight after eating a full pizza every night because it only has 300 calories per slice. What matters isn't the calories per slice, its what is the calorie level (economic output) in aggregate for the full pie. 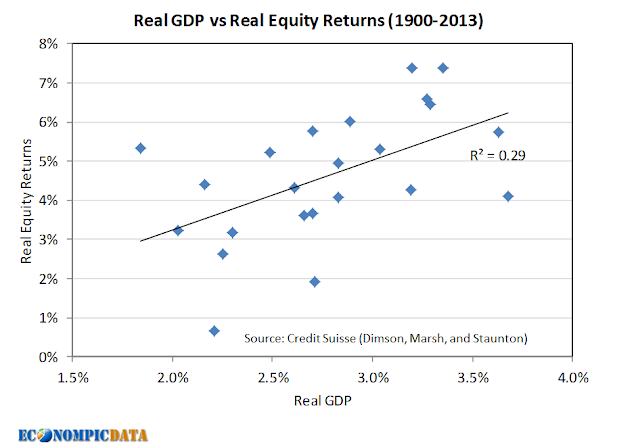 Now let's take a look at an apples to apples comparison... the total real economic output produced (real GDP) vs the total real equity return over the same period. We now see a scatter plot that moves up and to the right (vs down to the right). I would note that this exact chart is produced ON THE SAME PAGE as the above chart in their 2014 yearbook, but has seemingly been ignored. 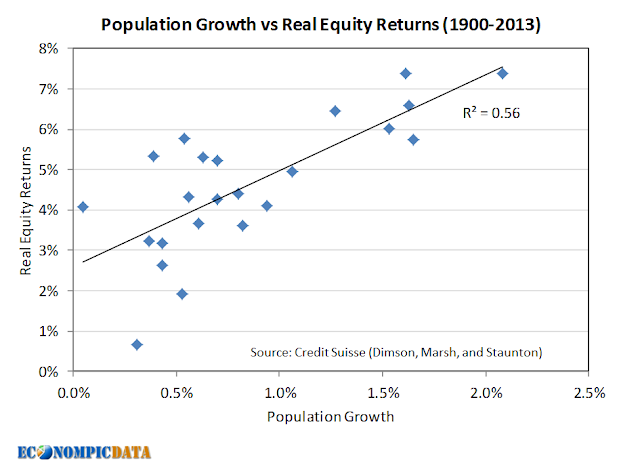 Despite the stronger relationship between real GDP and real equity returns, there is an even stronger relationship out there... population growth (i.e. the piece REMOVED from the per capita GDP calculation). I have not found this specific chart produced anywhere else in their yearbooks, but at a 0.56 r-square it is clearly the strongest relationship of the three (despite the lowest r-square result most often quoted), thus explains when you remove it why you get a non-existent relationship. To bring this full circle, David Salem outlined that he has found value in Asia ex-Japan ex-China despite its favorable growth and demographics. Instead, there is a case to be made that the allocation may make sense ONLY due to the favorable growth and demographics (it certainly does not appear to be a reason not to own this region). Combined with the attractive valuations in these markets, especially relative to the developed world, there is a very strong case to be made for diversifying to emerging / high growth countries.